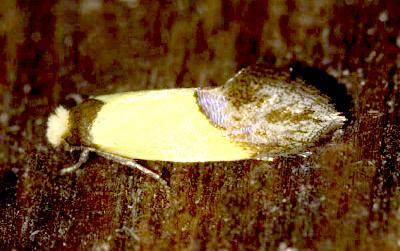 The adult moth of this species has yellow forewings, each with a dark brown base, and a broad irridescent brown margin. The hindwings are plain brown. The head has a tuft of yellow hair. The wings have fringed edges, those on the hind margin of each hindwing being almost as long as the hindwing is broad. The moth has a wingspan of about 2 cms. Melbourne University Press, 1990, pl. 3.13, 23.8, p. 185. Series 2, Volume 7, Part 4 (1892), pp. 548-549, No. 104.